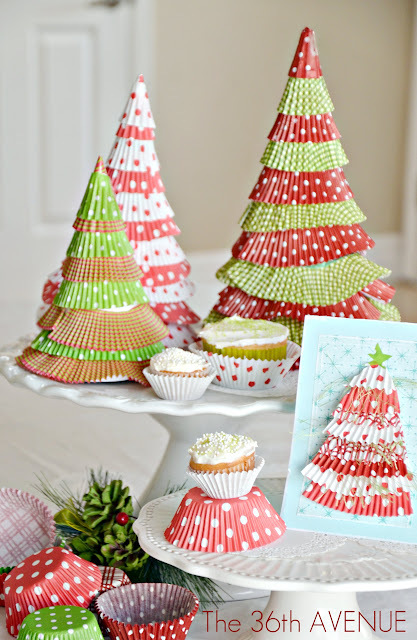 Easy Handmade Christmas Tree Tutorial using cupcake liners and card stock. 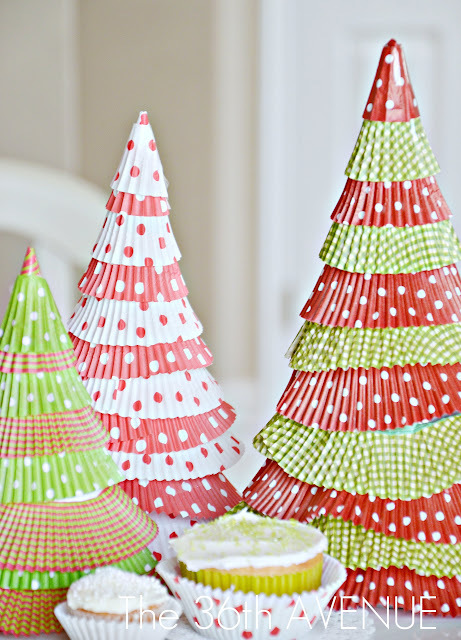 Enjoy making this Christmas craft with your kids! Super easy and cute! ©the36thavenue.com – DO NOT Copy, Save or Paste this image, post, or tutorial. Are they FUN or what?! This is such an easy and affordable project. All you need is 12×12 Cardstock, Cupcake Liners, and Tape. First of all make the cones with your cardstock. Tape the ends well so the cones hold their shape. Then cut the excess of the bottom so they can stand straight. The amount that you cut will determine the size of your tree. This next step is when Miss Fun joins the party. 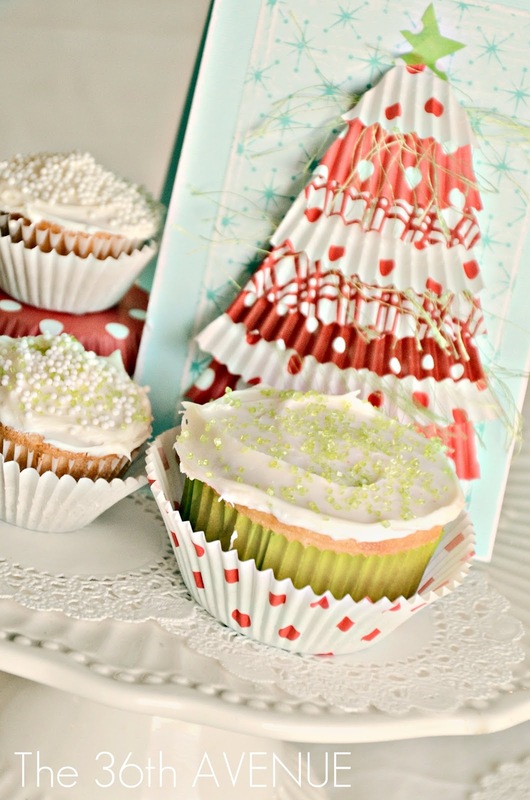 Cut the center of your cupcake liners. After you are done start taping the ruffles from the bottom to the top. 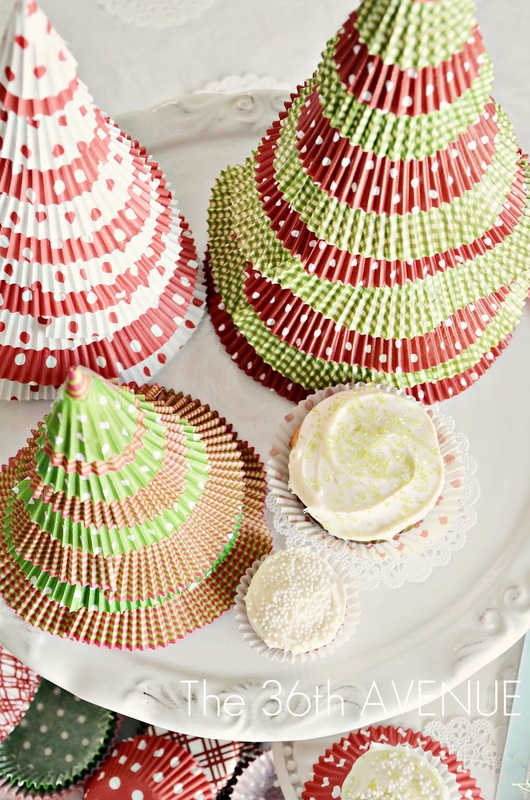 You may need to use multiple ruffles for one layer of the tree. Don’t even worry about it… It will look GREAT at the end! Before you reach the top cover the tip of the tree with one of the centers of the liners. 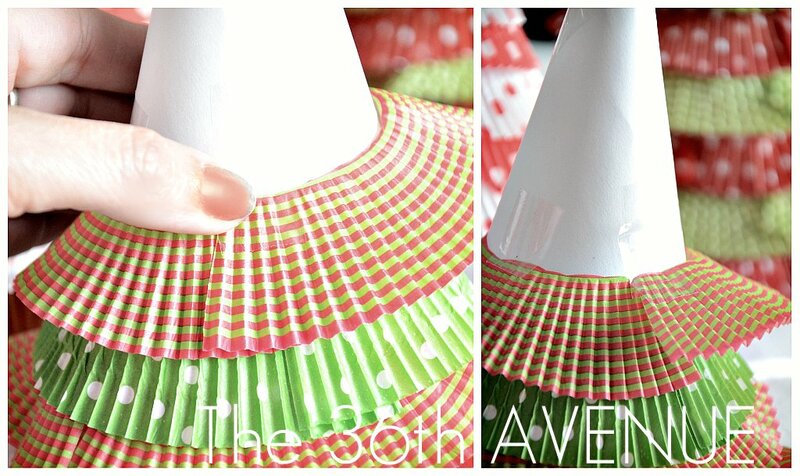 After it is taped and secured finish the last ruffle layer… and guess what? YOU ARE DONE MY DARLING! As I was working on this project I thought it would be adorable to give cupcakes instead of cookies this year to all of my neighbors. So I came up with a little Cup Cake Liner Christmas Card to wish Merry Christmas to my cul-de-sac. Click HERE for the tutorial! Previous8 Blogs= 1 BIG Christmas Link Party! Awesome IDea, and its very unique. ! They are so cutes, I shared them on my french blog, your tutorial with images is great and my readers won’t need translation ! Many thanks ! So colourful and fun! Love them – thanks so much for sharing. I have added a link to them on my recent Paper Tree post. You are so sweet Lisa. Thank you for stopping by! Ohhhhh these are SO cute!!!! Very cute, but minus the factor of scrapbooking paper as the form, couldn’t you use styrofoam? I know it would cost a little more, however, wonder if it would be easier to store. Love you back! I can’t wait for SNAP! We need to get together and make plans.